Teachers play a major role in making their students responsible citizens of tomorrow and good human beings. They are the cornerstone for future of the students. Teacher’s Day is celebrated to show acknowledgement and recognition of the hard work put in by teachers towards Students development. Students of St.Brittos College are immensely grateful to their Teachers and celebration was initiated by them on 06.09.2016 for showing the acknowledgement and recognition of the Roles of Teachers in their lives. The Event had a formal agenda with Prayer song, Welcome Speech to extend gratitude and warm wishes to all the Faculty Members present for the day. Student representatives from each department shared their views and memories of their most important teachers in their lives including Ms.Neha Johnson . 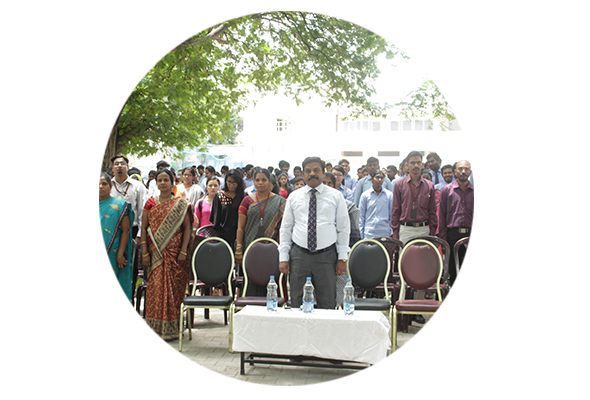 A Special Teachers Day speech was delivered and Faculty Members were given space to share their views about the Teachers Day celebrations. Mr.Chinnappan, Department of Commerce, Mrs.Abhinandana, Department of Shipping & Logistics, Mr.Sharan, Department of French quoted their comments and inspirations from their Teachers. To light up the spirits of the Celebration, a casual dance for entertainment and Fun games were conducted for the Faculty Members. Mrs.Abhinandana, Ms. Divya, Mrs.Varsha and Mr.Bastin participated in the fun game of ball picking and collecting. Students kindled the game mode on with their applauses and cheer. “A Cake is a symbol of Celebration”. To embark on this quote, A cake cutting was arranged by the Students inviting all the Faculty Members to make the Teachers day Celebration a remarkable one. Principal Mr.Thamas Ponraj gave his elegant speech instilling the values of modern day Teachers to play role of not only being a Teacher but also to be a Guide, Facilitator to achieve the holistic development of the Students. He conveyed heart filled appreciation for the students who have contributed to the success of the event. Teachers, on the day were reminded of their importance in every students life. All in all, it was celebration mode for every student of St.Brittos College. Last but not the least,Vote of Thanks was rendered by Mr.David, President, II MBA, conveying thanks to Principal, All Faculty members, Teaching and Non Teaching Staff, Student volunteers for their presence, support and guidance for the successful completing of this event.